So first things first, update the OS to about 16.04 LTS. Second thing install the graphics driver using Synaptic package manager. 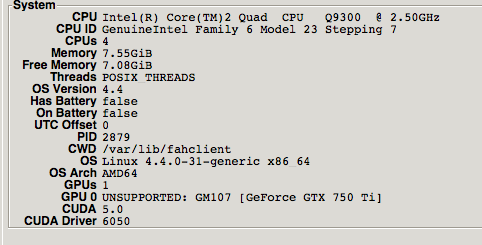 Third install FAH, and then connect to it….. So back to 14.04.4…. YAY, a working folding machine. So what about power consumption? So my M600 blades at full pelt with the 8 cores can do ~23000PPD but use around ~360w (without the chassis). My QC Core 2 Quad above without the graphics card at full pelt can do ~6500PPD and uses ~110w. 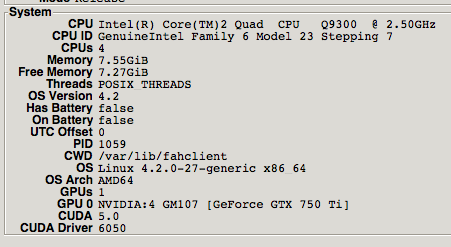 The same QC but now with a GTX750Ti at full pelt on the graphics and 3 cores on the CPU ~38000PPD using ~150w. the QC with 750Ti 38000/3.6kWh = 10500 points/kWh. So the QC with the 750 clearly wins and would generate around 13,870,000 points/year and cost £130 a year to run.